PJANG is a comic I've enjoyed since it started a couple of years ago. 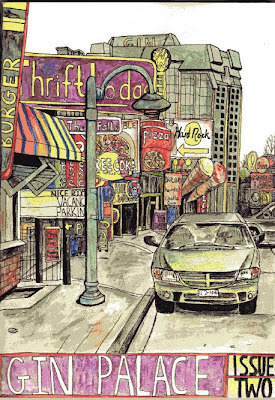 Each issue features two or three strips written by Rol Hirst and drawn by a different artist. The latest issue features two strips; Ex-Men drawn by Kelvin Green and Derek drawn by me. In a review written by Steve Miller he says, "It’s the first strip I’ve seen from Paul since the completion of ‘There’s No Time Like The Present’, and it looks like he had lots of fun with it, almost like it was a relief to break away from the storytelling mechanisms he imposed upon himself in that previous project." It's true, it was the first thing I drew after completing There’s No Time Like The Present and I DID have lots of fun drawing it. 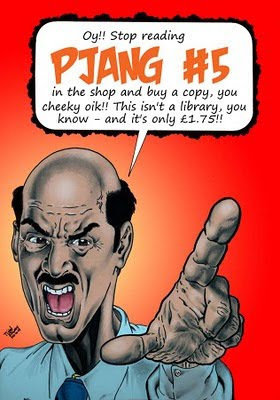 Copies of PJANG 5 can be ordered from Rol via his website. for just £1.75 including postage to the UK. A couple of updates for you. Firstly, SFX magazine's Comic Heroes features a review of BASTARDS 2, the high quality small press anthology to which I have contributed. Matthew Badham says the book had him laughing out loud. "Dr Kyle, a Doctor Who/Jeremy Kyle mash-up, is a tour de force." I still have some copies of BASTARDS 2 available for sale in The Shop. It costs £10, which includes postage to the UK. 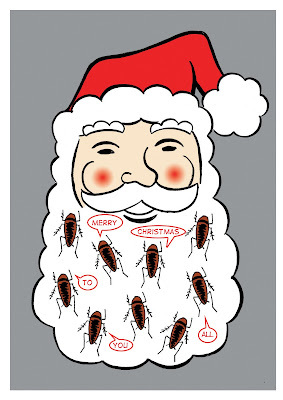 If you order it now, you should receive it by Christmas... 2011. 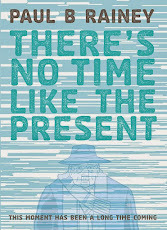 Secondly, Rob Jackson features There's No Time Like The Present on his best of the year list. "Now this 13 part series is finished I am definitely putting it on my best comics of the year list. It's great." All parts are still available and can be ordered from The Shop. 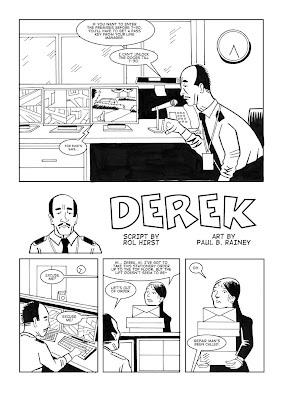 I have a strip appearing in the second issue of Rob Jackson's excellent booze influenced anthology, Gin Palace. The short is called Wednesdays and is about feuds between middle-aged dads who should be old enough to know better. Wednesdays appears alongside other great shorts by some of the best UK based comic creators today including Francesca Cassavetti, Andrew Cheverton, Dave Hughes and, of course, Rob Jackson. Copies cost £3 including P&P from Rob's website. 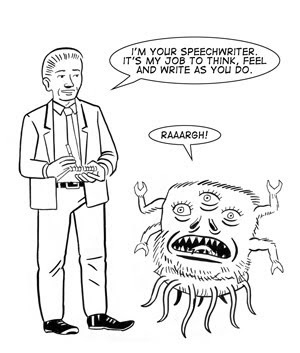 Two weeks ago I attended the launch of Speechwriting (Hale Expert Guides) by Simon Lancaster. It was a star-studded event held at The Groucho Club. The reason I was there is because I provided nearly thirty illustrations for the book. Many of the drawings I did can now viewed by going to this new section of my website I've set up. And if you're interested in owning a copy of Simon's excellent book then you can buy it from Amazon . I have some There's No Time Like The Present updates for you. Firstly, Paul Gravett, the curator of the That’s Novel exhibition, recently wrote about it here. There's more information about the exhibition along with a sample of one of the pieces I drew exclusively for it. Secondly, TNTLTP was name checked in the latest Utter Shambles comedy podcast hosted by Robin Ince and Josie Long. They were talking to Mark Gatiss about some of their favourite films, TV shows and actors when my name and the Ultranet are mentioned. I was out walking and listening to the show on my ipod and I was so surprised to hear my work mentioned in this context that I laughed into the face of a passing woman. The podcast can be downloaded for free from here. Finally, as well as being able to buy the entire series of TNTLTP from my website shop, it also available from the following real world venues - GOSH, Orbital and the London Print Studio in London, OK Comics in Leeds, Nostalgia and Comics in Birmingham, Worlds Apart in Liverpool and Forbidden Planet in Manchester. The centrepiece of this years Comica Comic festival is the That’s Novel exhibition taking place at the London Print Studio. The theme is Graphic Novels and on display is up to date work from some of the best creators working in comics today including Charlie Adlard (The Walking Dead), The Pleece Brothers (The Great Unwashed) and David Quantick (Louis Wain). I’m very proud to be able to tell you that I will also be displaying art from There’s No Time Like The Present as part of the exhibition. I have also produced four pieces of artwork spinning out of my strip exclusively for the show. Go here to learn more about the exhibition and this years Comica Festival including a full list of everyone taking part. That’s Novel runs from 22nd October to 18th December. Richard Bruton has posted a review of BASTARDS 2, the high quality book collection of British small press cartoonists including episodes of Ghost Zombie and The Doctor Kyle Show by me. "The quality is top notch, and there’s more than enough really enjoyable strips to make it worth your while forking out a tenner for this really solid collection." 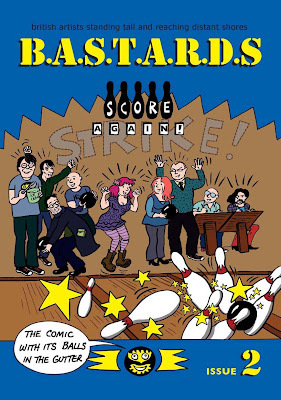 All contributors to BASTARDS 2 have copies for sale but you can also buy it directly from me for £10 (price includes P&P to the UK) using the Paypal button here or at BICS this weekend. My friend Robert Wells and I have started a comic review blog called On The Ration. The object of the blog is for us to only buy comics if they conform to a strict financial criteria. We post reviews of the value for money comics and graphic novels we find, including our methods of sniffing out a bargain, as well as our Objects of Desire. A great place to start reading the blog is with the rules here. We look forward to seeing you over there. Richard Bruton writes another astute review of the final issue of There's No Time Like The Present for the vital Forbidden Planet Blog and provides an overview of the series as a whole. "That was quite lovely and a perfect way to finish." Read the review here. Copies of the entire series are available to buy from The Shop. Dr Jonas Christ has posted a very positive review of Book of Lists to his blog, Crabbed Into Sunlight. "This is highly entertaining. Many sections are funny, some are serious, but all are very honest and open. He concentrates on the small details that make you laugh but are normally quickly forgotten." He also took this photograph comparing my looks with a Megabus driver called Norm. I'm in no position to dispute that. Copies of Book of Lists are still available to order from my Shop. Martin Eden's great superhero comic Spandex has enjoyed unexpected but deserved attention since its first issue was published at the end of last year. He has generously decided to spread the opportunity around amongst other comic artists by running Japandex on his website throughout June. Japandex is a project where artists are invited to contribute their own spin on the theme with a new illustration appearing each day. Mine, which was published yesterday, features Martin's character Neon fighting Father Christmas... Manga style. Seriously, it's worth checking out when you have time because the contributions are stunning. Richard Bruton reviewed the latest part of There's No Time Like The Present at the start of the weekend on the Forbidden Planet Blog. "It’s genuinely a pleasure to be able to say that (unless issue 13 is unbelievably awful – which is highly unlikely) this sci fi soap opera with it’s varied and unusual, non-stereotypical cast of characters lives up to every bit of early promise it showed." All twelve issues so far can be bought from my Shop, GOSH in Central London and OK Comics in Leeds. Also, there's been some lovely coverage of the end of the 2000 AD Prog Slog Blog on the Forbidden Planet Blog, Down The Tubes and Pete Ashton's website. 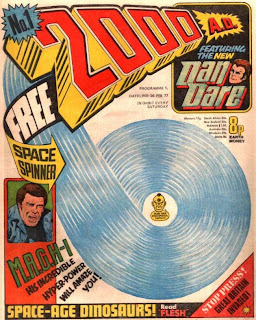 In November 2006, after an impetuous ill-thought out bid on eBay, I won the first 1188 programmes of 2000 AD. Rather than just have them sit piled up in my bedroom collecting dust tormenting me about how much money I had spent on them, I decided I was obliged to read them all. I thought, rather than just read them why not blog about the experience too. So, I started the 2000 AD Prog Slog Blog where I review every other issue of the Galaxy’s greatest comic and many of it’s associated publications. Well, after three and a half years of thrill power intensity turning my mind into a boggled mess and over 700 entries , the blog is due to come to it’s intended conclusion this weekend. Of course, I would like to tell you how proud I am to have got this far but there’s a part of me that feels ashamed at having used up so much time on a project which, let’s face it, is obsessive and stupid. All I can say for certain is, ‘it’s been emotional’ and ‘thank God it’s over’. If you ever read 2000 AD when you were younger or have an interest in the blog then you can read all entries so far here. The final prog is scheduled to be reviewed early tomorrow evening while the farewell entry will appear sometime over the weekend. Finally, if you’re one of those people who think that the 2000 AD Prog Slog Blog should continue then you will be pleased to know that David Page is picking up where I will be leaving off on his blog. Copies of part 12 of There's No Time Like The Present are now available to buy from GOSH in Central London and OK Comics in Leeds. 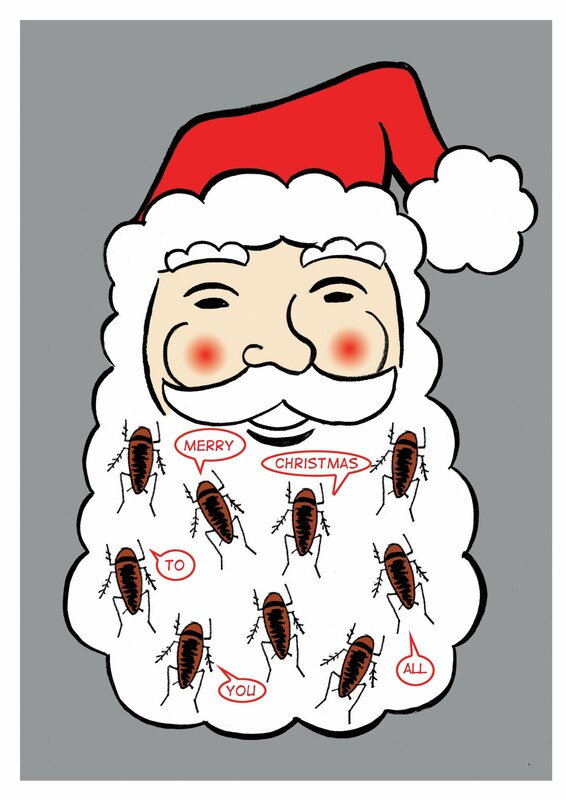 If you can't get to these great stores then, of course, they are still available from my online shop here. Rol Hirst has posted a review here describing it as "brain-meltingly wonderful" and Rob Jackson has one here. Rob also mentions me in an interview for The National Post arts section in answer to 'Who's the most under-appreciated comic artist working today?' Well, of course I am; it's just not for me to say, that's all. Every two weeks, The Paper Jam Comics Collective meet in the Newcastle Travelling Man store. They are a creative community who often also run a book club. Anyway, I'm delighted to be able to tell you that the the next book they are reading is Book of Lists. If you don't live in Newcastle but would like to take part then you can do so by buying a copy from me in The Shop and, er, reading it. Currently taking place in our nation's great capital is the Sci-Fi London festival. Starting on Wednesday just gone and finishing on Monday May 3rd, the theme for this years festival is Life in 2050. Now, I'll be honest with you, I like a bit of science fiction, but I'm not immersed enough in the genre to have heard of this festival before this year. Making my ignorance appear even worse is it seems to be quite a big festival. So when I tell you that on Saturday at 1 PM I will be appearing on a panel called Future Publishing you might be surprised. When I think about how little I know about publishing in 2010 let alone 2050, so am I. Fortunately, if you go to the website you will see that the other panel guests look pretty good so, hopefully, they'll take up my slack. If you're attending the festival or in the area, then you might like to pop by and watch me make a fool of myself in public. I had another very enjoyable UK Web Comix Thing and Schmurgencon yesterday. Thanks to everyone who said hello. My personal highlight was winning the Best Writer/Artist award at Schmurgencon. I won because I was there and, when Schmurgen asked who should win it, I shouted my name out first. I have had lots of positive feedback to to There's No Time Like The Present part 11 via email, post and reviews which I'm delighted by. Richard Bruton at the Forbidden Planet blog writes, "it’s a thoroughly entertaining, deliciously complicated and intriguingly staged bit of domesticated science fiction" while Rol Hirst says, "this book continues to surprise." The problem with quoting more from these reviews and talking about part 11 in general is that it's difficult to do without giving away any spoilers. So, if you haven't read the latest issue yet, my advice to you is to save the following two links somewhere and only go to them once you've read it. Copies can be bought from GOSH in Central London, OK Comics in Leeds or from me using Paypal via my Shop. The Forbidden Planet blog has been running a series of fun features where personalities from the British comics scene list their picks of 2009. No, I'm not one of the contributors (which I'm fine with, honestly) but I'm delighted to report that in today's entry Martin Spandex Eden includes Book of Lists as one of his three favourite books. 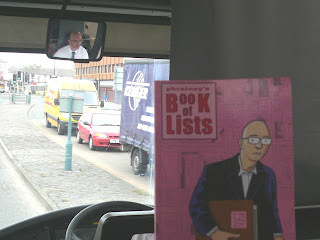 Also, writer Rol Hirst recently placed Book of Lists as his second favourite comic of 2009 which is great as I have it on good authority he read a lot of them last year. Of course, as we all know, Book of Lists is ahead of its time and is so this decade.